Today, I'm sharing a guest post that features spicy grilled mahi mahi that's topped with a spicy-sweet mango salsa. With grilling season upon us, this is a healthy and refreshing dinner option. It doesn’t get much more summery than food cooked on the grill. Biting into a juicy burger, hot dog or grilled chicken sandwich covered in char marks will make you feel like you’re lounging poolside, even if it’s cold and rainy or you live hours away from the nearest beach. One of the other great things about using your grill in the Spring and Summer is that you’ve got dozens of grill recipes to choose from. Whether you’re in the mood for classics like burgers and bratwursts or dying for a slice of grilled pizza, there’s essentially no limit to the types of food you can make on the grill. It’s versatile, quick and simple to use — what more can you ask from a cooking tool? 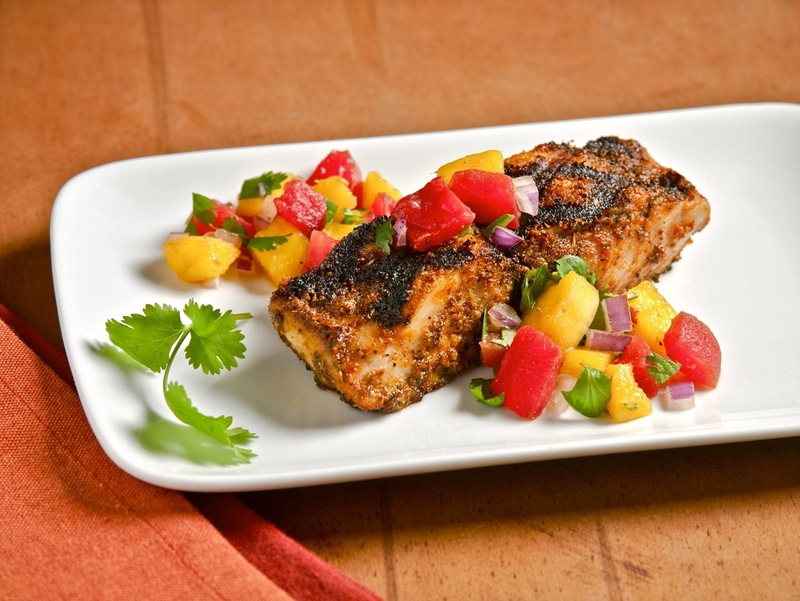 Blackened mahi mahi with mango salsa takes all of the best flavors of summer — fresh fish, juicy mango, zesty cilantro, flavorful tomatoes and spicy jalapeno pepper — and mixes them up into one easy dish. Not only is it bursting with summery flavors (tomato recipes are particularly in season during the warmer months), but it’s incredibly simple to make. Just throw together a bunch of spices you probably already have in your pantry, grill up your fish, top with salsa and there you have it: a light summer dinner ready in under an hour. Step 1: To make the blackening paste, combine the 1½ teaspoons cumin, garlic powder, dried oregano, ground ginger, smoked paprika, salt, black pepper and red pepper in a small bowl. Stir in olive oil to make a saucy paste. Divide the mixture in half and set aside one portion. Step 2: Brush half of the paste on your fish fillets; set aside. Lightly spray the grill with PAM. Heat to high heat; when it’s hot, add the fish and cook for 3 to 4 minutes per side, turning once. For a smokier grilled flavor, use hickory or oak chips on your outdoor grill. Step 3: While the fish is cooking, combine the drained tomatoes, mango, jalapeno, red onion, cilantro, the 1 teaspoon cumin, garlic and lime juice in a medium bowl. Set aside until fish is done cooking. Step 4: Remove fish from the grill once it flakes easily with a fork. Brush the remaining paste on the cooked fish and top each fillet with the mango salsa. Serve with grilled veggies or a big green salad for a complete meal that’s completely delicious! Try this fish recipe out the next time you’re in the mood for a fresh outdoor meal, and be sure to let us know how it turns out for you. Enjoy! Disclosure: This is a guest post by Meredith K. on behalf of Hunt’s®. For more delicious grilling ideas, along with your favorite lasagna and easy meatloaf recipes, visit www.hunts.com.